Mount Rainier proudly stands at a staggering 14,440’! On a clear day, this mountain dominates the Seattle/Tacoma skyline. Its beauty draws visitors from around the world each year yet this volcano remains active today. Mount St. Helens, only 50 miles south of Mount Rainier, reminds us of its explosive power when it had its last major eruption on May 18, 1980. The thermal energy released during this eruption was approximately 26 megatons leaving ash across 11 states and 5 Canadian Provinces and created massive volcanic mudslides called Lahars. This event claimed approximately 57 lives and 1.1 billion in damage. Both mountains are a part of the Pacific Rim of Fire and again someday will show its dominance. Until that point, people will continue to stare at this beautiful mountain and have that uncontrollable urge to go see all that it has to offer. 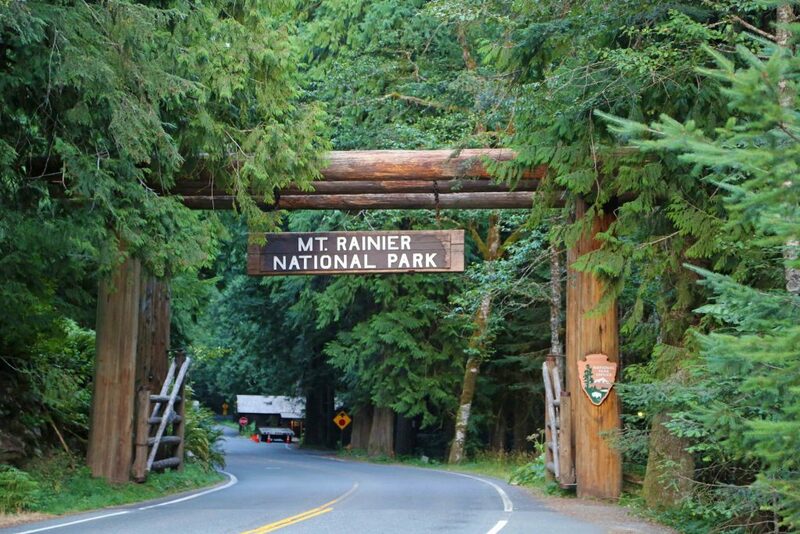 Now it’s time to see my list of Things to do Mount Rainier National Park. Mount Rainier hiking is amongst the best in Washington! 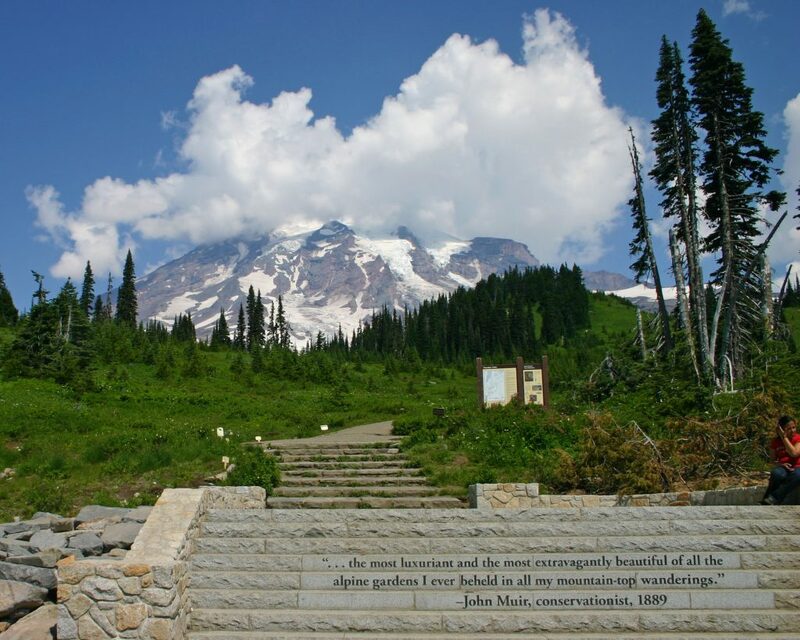 I tell everyone that while visiting Mount Rainier National Park, they must go to the Mt Rainier Paradise Visitor Center and go outside and read the John Muir quote on the steps leading out to the trails in the Paradise area. You may ask me why? It’s time for me to pull out my Park Ranger hat and give you a small interpretative Program. John Muir was an incredible person! Known as John of the Mountains, he became Americas most famous conservationist and naturalist and president of the Sierra Club. He was an eloquent writer and speaker and inspired people to protect some of America’s greatest treasures like Yosemite, Grand Canyon, Sequoia & Kings Canyon, and Mount Rainier. His passion fueled the formation of the National Park Service and earning him the nickname of Father of the National Parks. Some of his best quotes include “The mountains are calling and I must go” and “In every walk with nature one receives far more than he seeks”. Muir advocated for the protection of Mount Rainier from 1893-1899. He worked with several groups to lobby together for the establishment of this park and on March 2, 1899, Mount Rainier became America’s fifth National Park. The National Park Service placed a John Muir quote on the steps just outside the Paradise Visitor Center leading up the Skyline Trail towards the summit. It’s something that each visitor to this park should stop and appreciate the quote and the importance of John Muir to Mount Rainier. 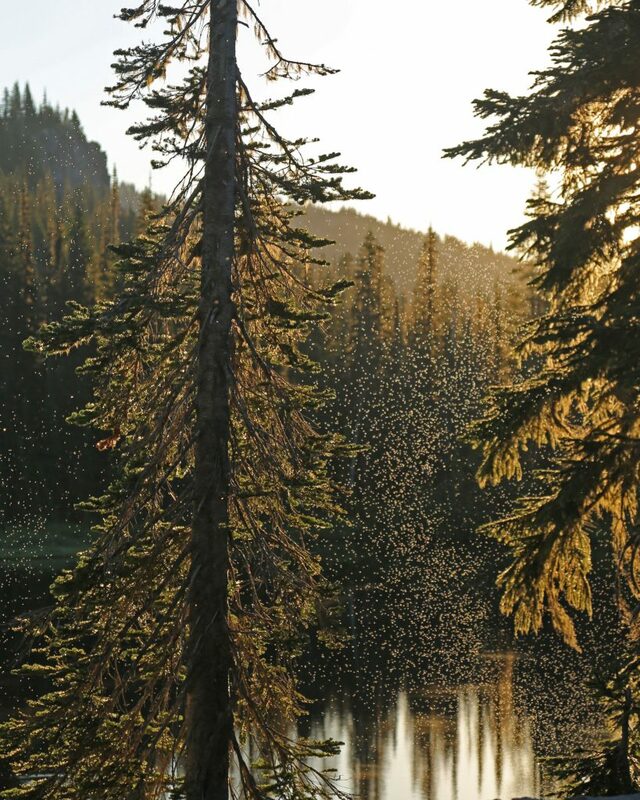 Summers are special at Mount Rainier! It’s a time where hundreds of varieties of wildflowers bloom turning this mountain into fields of purple, magenta, white and yellow. Common varieties include Lupine, paintbrush, Avalanche Lilies, and Beargrass. There is nothing quite as pretty as seeing fields of flowers topped with the snow-covered mountaintop in the background so make sure to bring wildflower guide and your camera and be prepared to take hundreds of photos. If you are lucky you will also find wild huckleberries growing along a trail. They are pretty and just taste great! Wildlife viewing goes beyond seeing a deer, squirrels and a few birds. There are 65 mammal species and 182 species of birds that have been identified here. 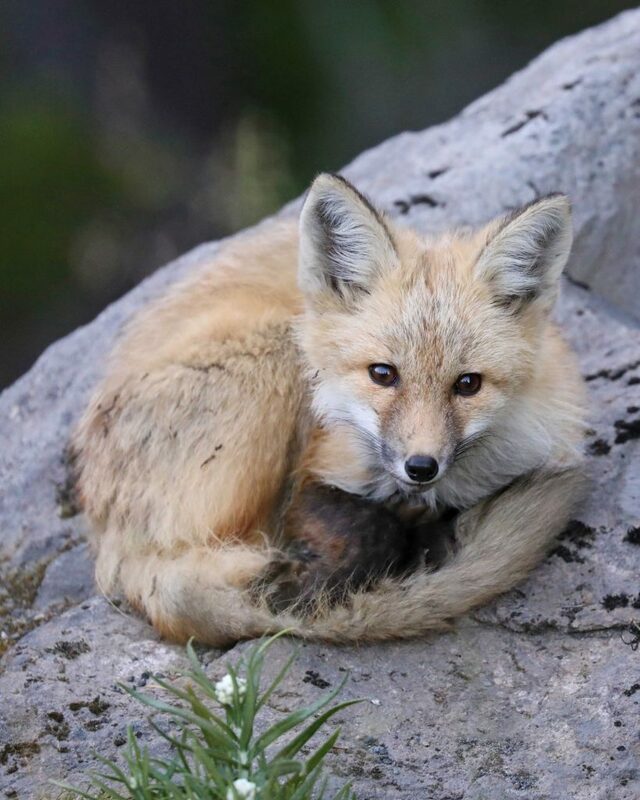 I have personally seen Black Bears, Cascade Red Fox, Elk, Deer and rabbits, Ptarmigan, Steller’s Jay, Osprey’s and much more! If you’re lucky you might see a Bobcat or Mountain Lion or even Mountain Goats. There are also several threatened and endangered species in the park as well including the Northern Spotted Owl, Marbled Murrelets and Peregrine Falcons. The American Pika is a tiny tail-less relative of the rabbit that lives in high altitude rock fields and is being severely threatened due to climate change. The American Pica is very sensitive to heat and can die when temperatures exceed 75 degrees Fahrenheit and have already seen whole communities disappear! The last I have heard is the American Pica has been denied official Federal Endangered Species Protection and would be the first species listed due to climate change. Reflection Lake is one of those iconic photos that have made the National Parks Service famous! It is also easy to see from the parking lot and is something that everyone can enjoy. The real trick is being here when there is no wind so that you get the reflection of Mount Rainier is on the water. I have been to Mount Rainier many times and have been here more times where the reflection is not visible than when it was. Make sure to give yourself a few days to explore this park just in case the wind is blowing. I have seen the reflection on every trip to Mount Rainier but sometimes I have had to make a few trips here before the wind is calm. Park Ranger Pro Tip: Mosquitoes like standing water and when there’s no wind you can find yourself becoming a blood donor. Make sure to bring mosquito repellent so you can enjoy this iconic view and to soak in the moment. Mount Rainier has tons of great hiking trails! You can enjoy waterfalls, Old Growth Forests, lush meadows filled with wildflowers and even climb to its snow-capped summit. Perhaps you could be one of the lucky few to obtain a wilderness permit to hike the 93-Mile Wonderland Trail that goes all the way around Mount Rainier! One of my personal all-time favorite hikes is the Skyline Trail that starts at the Paradise Visitor Center. It’s a 5.5-mile hike that climbs 1700’ in elevation with incredible wildflower fields and an epic view at Panorama Point. This is a beautiful place to stop for lunch and look out at Mount Hood, Mount Adams and Mount St. Helens in the distance. 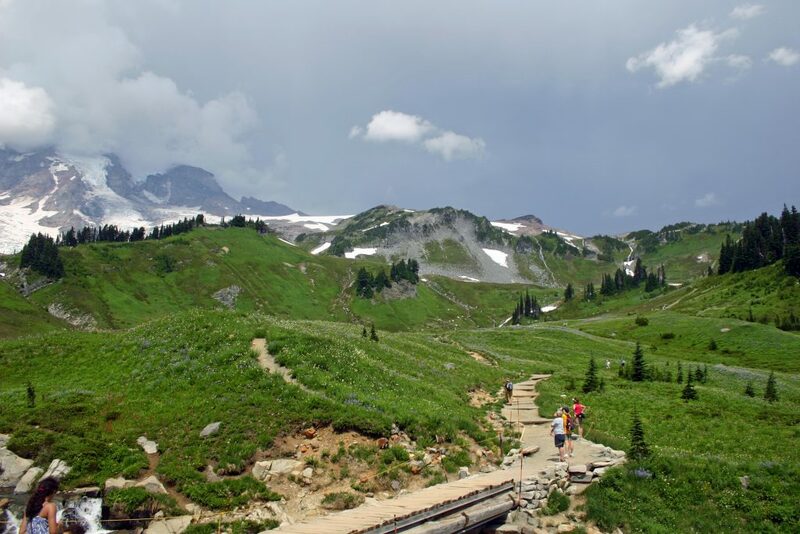 You can also take the Naches Peak Loop Trail and hike a small portion of the Pacific Crest Trail that weaves in and out of the eastern boundary of Mount Rainier National Park. This is a great trail for seeing wildflowers, views of the mountain and enjoying a few huckleberries that grow along the trail in late summer/early fall. Are you the adventurous type? Do you seek out adventure? Perhaps standing on top of an active volcano is just for you! A hike to the summit of Mount Rainier will include over 9000’ and almost 2000 feet per mile elevation gain in eight miles as you climb up on the most heavily glaciated peak in the lower 48 states. It also has the reputation of being the lower 48’s biggest and baddest mountaineering challenge. This is nothing to take lightly! You should be in the best shape of your life and come prepared. This hike is not for the ill-prepared and you can easily find yourself in a life-threatening emergency quickly if you do. 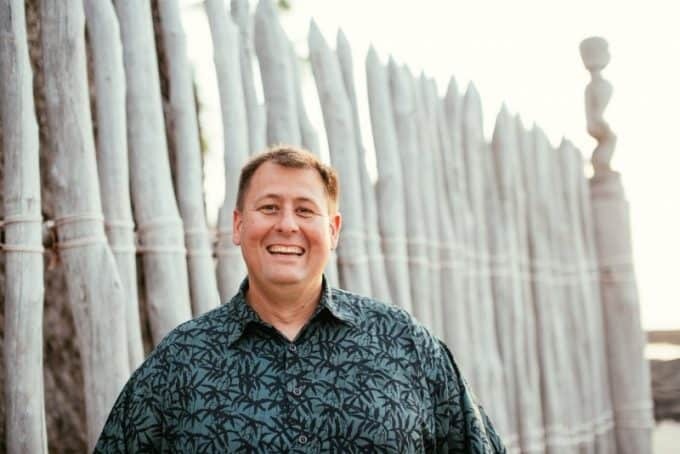 Go to the National Parks website to learn more about taking on this adventure including routes, guides, minimum requirements, fees, age limits, and reservations. Mount Rainier National Park was the first to be designed using a master plan and is home to numerous buildings developed using the National Parks rustic style design often referred to as Parkitecture. The Longmire area itself is a superb example of this concept and is a National Historic Landmark District. It is also where most visitors get their first glimpse of Mount Rainier National Park. 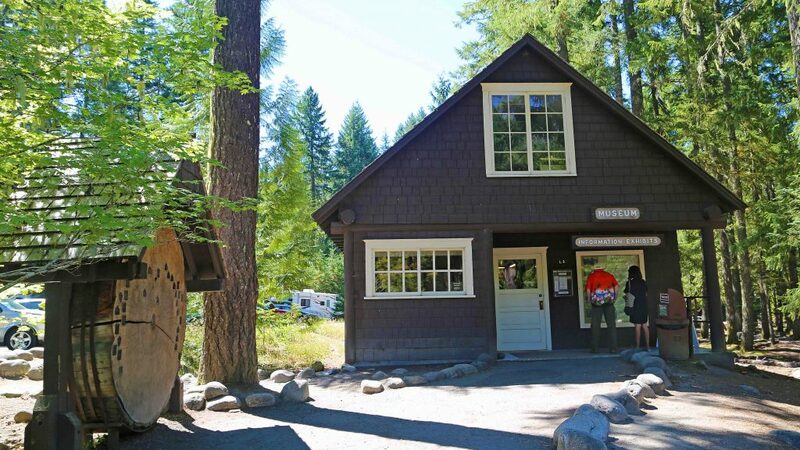 This beautifully preserved area is open year-round dependent upon weather conditions and has a gift shop, the Longmire lodge, a historic museum that was the original park headquarters when Mount Rainier was established in 1899 an old gas station and the wilderness information at the Administrative building. There are three hiking trails in the Longmire area including the Trail of the Shadows that starts right across the street from the historic district. This all makes for a great first stop to the park! There are several waterfalls within Mount Rainier and can be easily accessible as you drive up to Paradise from the Longmire Area. 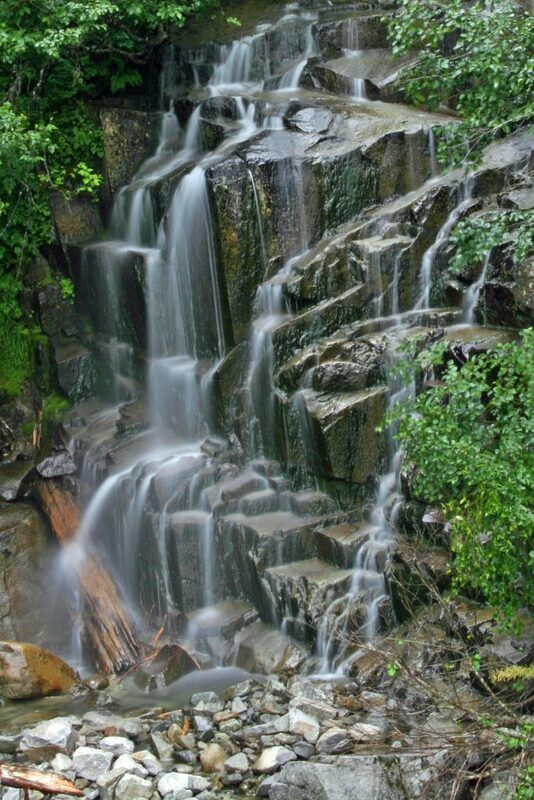 Make sure to make a quick stop and visit Christine Falls and Narda Falls as both are short hikes with nice views. You can also take a nice 3.8-mile hike to Comet Falls, Mount Rainier’s tallest accessible waterfall at approximately 460 feet. This trail also follows along the Van Trump Creek with several smaller waterfalls along the way. Just be prepared for heavily used trails and busy parking lots as all these hikes are very popular in the park. It’s no secret that I love a good beer. They seem to taste even better after a busy day hiking and exploring. Throw in a beer inspired by a National Park and I feel right at home! We had spent the day exploring Mount Rainier and checked into the Paradise Inn and was about to head out to see some wildflowers and see the sunset when I noticed a gift shop. 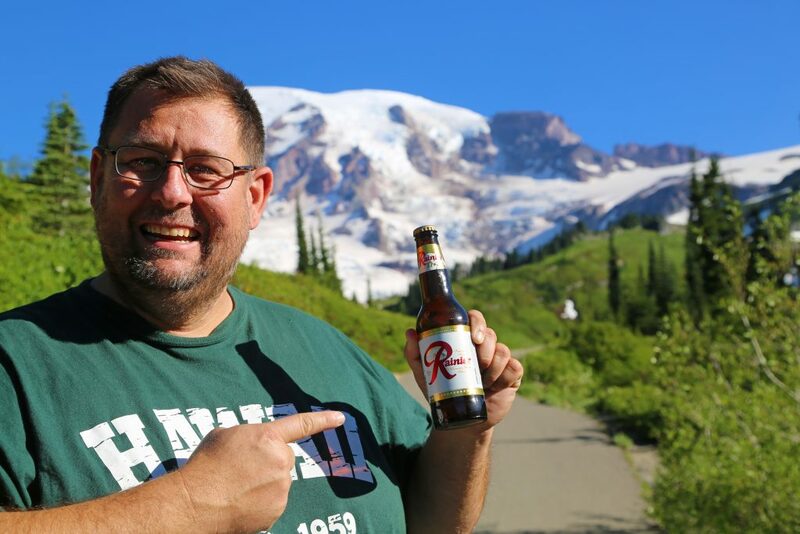 Then I saw happiness, a cooler filled with cold Rainier beer, or Reinbeers to the locals. There seemed to be one in particular that began taunting me, calling me by my name and begging me to go take it out of this cooler so it too can see the mountain at sunset. I did just that before lightly twisting its cap and enjoy the sunset together. The Historic Paradise Inn is one of the crown jewel hotels of the national park system. It’s National Park Rustic style draws you inside as you stare at its beauty. 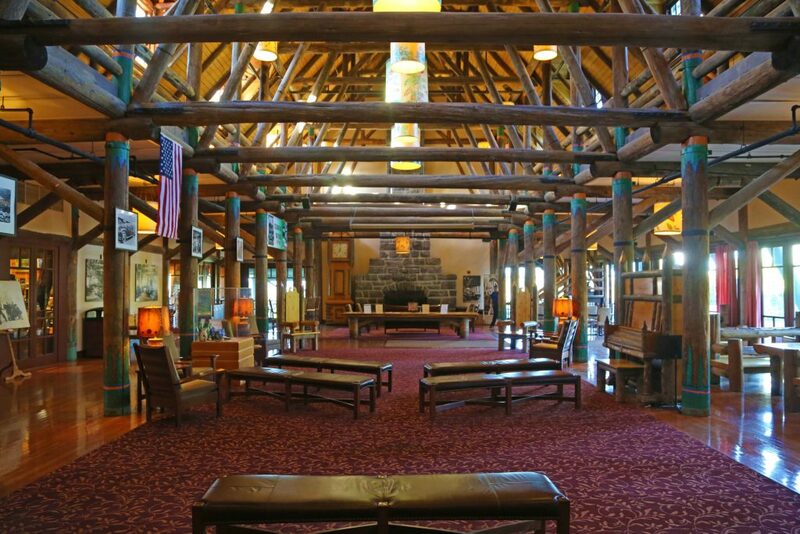 Notice the Alaska Cedar beams above your head and the timber benches and tables in the lobby? These logs came from the Narda Falls Cedar Forest area of the park and these logs were harvested after the wildfire swept through the area years before. These benches invite you in to relax and enjoy a snack or even a ranger program in the evenings. The lodge was completed in 1917, this hotel has proudly withstood 100 years of severe Cascade winters and provides a resting place for many park visitors. Late 2017 the lodge will be undergoing some construction to get it ready for another 100 years for park visitors to enjoy! Make sure to also check out my article on the Paradise Inn Lodge! 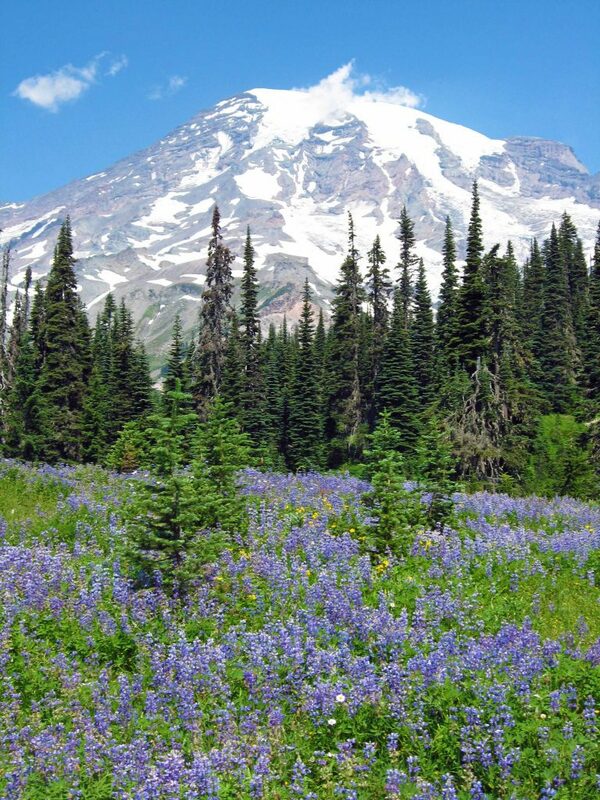 I could go on and on about Mount Rainier National Park! There is so much to see and explore and didn’t even cover all there is to do in this magnificent park. I will continue writing about travel tips, camping, lodges, winter recreation and hiking trails in the future. 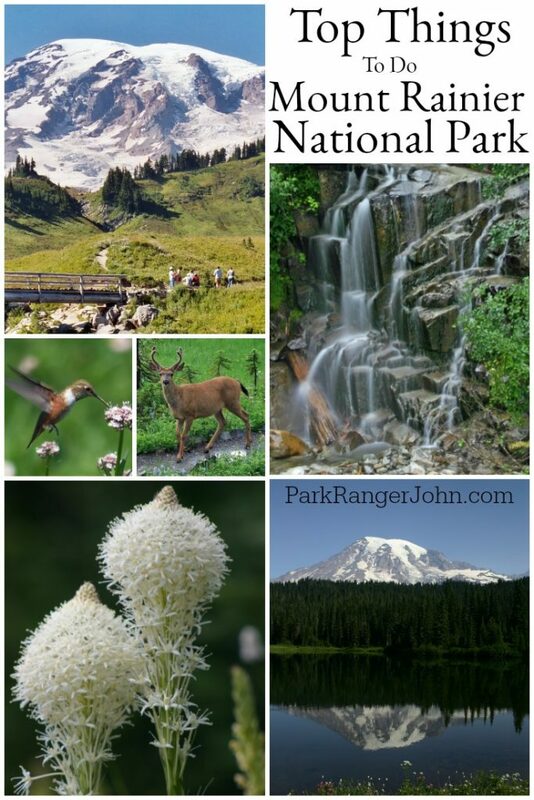 I hope you enjoyed my list of things to do in Mount Rainier National Park!